Looking for a creative way to incorporate something blue into wedding designs? Consider a punch of refreshing color, à la Carrie Bradshaw's fabulous blue wedding day shoes. Sapphire, aquamarine, sky or cobalt--even when blue isn't part of a wedding's color scheme, it has a stylish place in wedding accessories. From the subtle hint of blue on a garter, to the bold accent of an ornate blue brooch, this is a tradition to have fun with. All shades of blue look stunning with traditional wedding jewelry elements like pearls and crystals. For an up-to-the minute piece, consider using fashionable turquoise. This brilliant color is flattering with all skin tones, and looks gorgeous with sterling silver. For a more traditional look, consider paler shades like ice or powder blue. 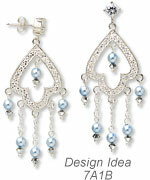 Swarovski crystals and pearls in subtle shades of blue are understated and elegant. Sapphire blue is eye catching and adds an element of intrigue. This is the perfect shade for the adventurous bride. Wedding day jewelry designs made with pearls, Swarovski crystals, gemstones and precious metal findings are heirloom-quality pieces that can be treasured by loved ones for years to come. Remember, today's "something blue" might just double as tomorrow's "something borrowed." Think of the vibrant blue of mountain "jade" in an ornate Marcasite and sterling silver setting to create a wedding day brooch with vintage beauty and timeless appeal. 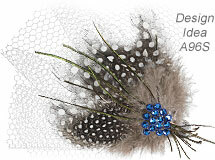 The fashion forward bride will appreciate the unique flair of feathers and sparkling blue rhinestones on a whimsical hair clip. Petite and beautiful Swarovski crystal heart pendants add a hidden surprise on garters or bouquet wraps. A mix of delicate light blue Swarovski pearls and crystals make chandelier earrings another way to incorporate an understated hint of blue.